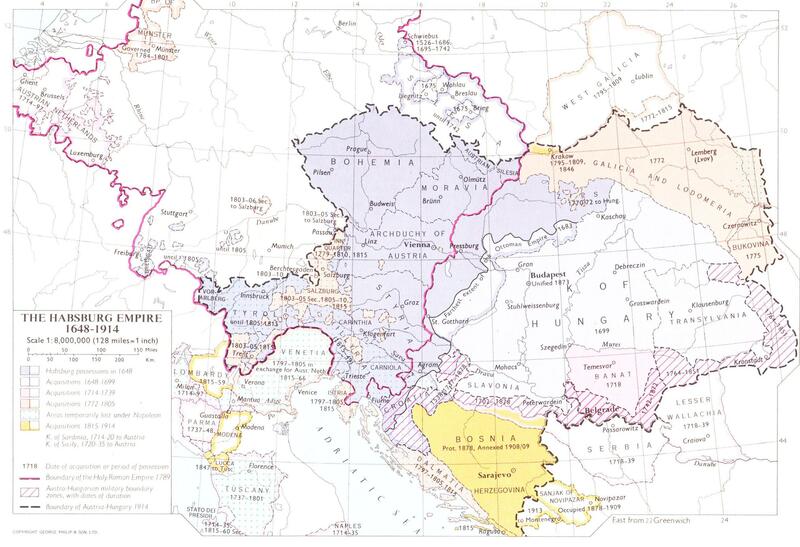 The Military Frontier was a borderland of the Habsburg Monarchy and later the Austrian and Austro-Hungarian Empire. It acted as the cordon sanitaire against incursions from the Ottoman Empire. When created in the 16th century by Ferdinand I, the region was divided into two districts under special military administration: the Croatian Military Frontier and the Slavonian Military Frontier. Initially, the Military Frontier came under the jurisdiction of the Croatian Sabor and ban but, in 1627, it was placed under the direct control of the Habsburg military. For more than two centuries, they would retain complete civilian and military authority over the area, up to the abolition of the Military Frontier in 1881. During the 17th century, the territory was expanded towards the East and new sections were created. By then, it stretched from Croatia proper in the west to eastern Transylvania in the east and included parts of present-day Croatia, Bosnia and Herzegovina, Serbia, Romania and Hungary. During, this period, the defence system was also changed, from a conventional garrison model to one of 'soldier-settler' communities. The inhabitants of the area were known as the Grenzer, or 'Frontiersmen'. They were colonists, mostly ethnic Serbs, Croats and Germans, who undertook to defend the Monarchy in return for their land-grants. Germans had been recruited by Hungary in the late 18th century to resettle and develop the Danube River Valley, and became known as Donauschwaben. The military regiments formed by the settlers had a vested reason to stand and fight and were familiar with local terrain and conditions. They soon gained a formidable military reputation. The Ottoman wars in Europe caused the border of the Kingdom of Hungary – and subsequently that of the Habsburg Monarchy – to shift towards the northwest. 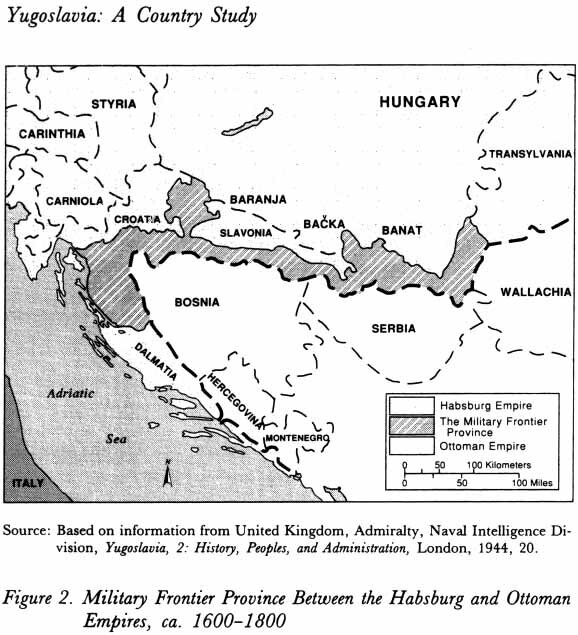 Much of the old Croatian territory either became Ottoman land or bordered the new Ottoman domain. In 1435, in an attempt to strengthen the defences against the Ottomans and Venice, King Sigismund founded the so-called tabor, a military encampment, each in Croatia, Slavonia and Usora. In 1463 King Matthias Corvinus founded the banovina of Jajce and Srebrenik, and in 1469 the military captaincy of Senj, modeled after the Ottoman captaincies in the Province of Bosnia. All these actions aimed to improve defence, but ultimately proved unsuccessful. But, they did lead to development of the Croatian Pandur infantry and the Serbian Hussar cavalry. After 1526 the Croatian Parliament elected the Austrian Habsburgs as kings of Croatia, and Emperor Ferdinand promised the Croatian Parliament that he would give them 200 cavalrymen and 200 infantrymen, and that he would pay for another 800 cavalrymen who would be commanded by the Croatians. Soon the Habsburg Empire founded another captaincy in Bihać. In the short term, all this was ineffective, as in 1529 the Ottomans swept through the area, captured Buda and besieged Vienna, wreaking havoc throughout the Croatian border areas. The new military expenditures became a considerable concern, and the Congress of Inner Austrian lands in Bruck an der Mur in 1578 defined the obligations of each land in covering the military expenses and defined the priorities in improving the defensive strategy. The nobility of Styria financed the Upper Slavonian Frontier while the others (Lower Austria, Upper Austria, Carniola, Carinthia and Salzburg) financed the Croatian Frontier. By the end of the 16th century, the Croatian Military Frontier became known as the Karlovac generalate, and from the 1630s the Upper Slavonian Military Frontier was known as the Varaždin generalat. During the 16th and 17th centuries, the military administration of the Frontier was moved away from the Croatian ban and the Sabor (Parliament) and instead instated in the high command of Archduke Charles and the War Council in Graz. Despite the financial support of the Inner Austrian nobility, the financing of the Military Frontier was not efficient enough. The military leadership in Graz decided to try solutions other than mercenary units. In the 1630s the Imperial Court decided to give land and certain privileges to immigrants into the Frontier (the uskok guerrillas as well as refugees from Ottoman-controlled lands) at the area of Žumberak. In return they would serve in the Imperial army. The remaining local population was also encouraged to remain by receiving the status of free peasants (rather than serfs) and other privileges. These new units were organized into ten or more voivodeships per each captaincy. In 1627, the Military Frontier was removed from the control of the Croatian Sabor and put under direct rule of the Habsburg military. It would have complete civilian and military authority over it until abolition of the Military Frontiers. Migration of the Serbs (Seoba Srba), by Paja Jovanović, portrays Serbian Patriarch Arsenije III Čarnojević, surrounded by soldiers, flocks of sheep and women with babies, leading some 36,000 families from his seat in Peć, to what is now Vojvodina in 1690, after the failure of a Serb revolt. In November 1630, the Emperor Ferdinand II proclaimed the so-called Statuta Valachorum ("Vlach Statute"), which regulated the status of so-called Vlach settlers (which included Croats, Serbs and Vlachs) from the Ottoman Empire with regard to military command, their obligations, and rights to internal self-administration. Over time, the population of the Frontier (as it was then) became mixed between the autochthonous Croats and Croatian serfs who had fled the Ottoman territories, and the numerous minority of the Serb and Vlach (who were later assimilated into Croats and Serbs) refugees who strove to expand their rights as a major contributor in the defense of the land. By creating the new military class in the Frontier, the territory of the Frontier eventually became fully detached from the Croatian Parliament and the ban. The Territory of the Frontier had a large Serb population, who fled from their south-eastern lands, and tried to fight the Ottoman forces, making a refuge in Habsburg Croatia. As freedom of faith was granted to them, they preserved their Orthodox faith in spite of their living in a Catholic country. Eventually, the whole male population of the Military Frontier became professional soldiers who served the Empire on several fronts and through many European wars, even after the relaxation of the Ottoman threat. During the 17th century territory of the Military Frontier was expanded towards the East and new sections were created. By then, it stretched from Croatia proper in the west to eastern Transylvania in the east and included parts of present-day Croatia, Serbia, Romania and Hungary. The area was settled primarily with Croatian, Serbian and German colonists (known as grenzer and graničari) who, in return for land grants, served in the military units defending the empire against Ottomans. The majority of immigrants were Serbs, and some were ethnic Croats, mainly from Bosnia. A large migration of Serbs to Habsburg lands was undertaken by Patriarch Arsenije III Čarnojević. The large community of Serbs concentrated in Banat, southern Hungary, and the Military Frontier included merchants and craftsmen in the cities, but mainly refugees who were peasants. The 17th century was a relatively peaceful period, during which only smaller raids were made from the Province of Bosnia. After the Ottoman army was repelled at the Battle of Vienna in 1683, the Great Turkish War ended with much of the former Croatian lands under Habsburg control. Despite this, the Frontier system was retained, and expanded onto former Ottoman territories in Lika, Kordun, Banija, lower Slavonia, Syrmia, Bačka, Banat, Pomorišje, and Transylvania. The Habsburg Empire valued the ability to centrally control the area and to draft cheap and numerous army units. After the Treaty of Karlowitz of 1699, the Seressaner troops were established with both military and police duties. They were not paid, but were exempted from taxes. Over the following century, each regiment had one section of Seressaners that organized border patrols towards Bosnia, particularly on difficult terrain, and stopped incursions of bandits. After 1767, every twelfth inhabitant of the Military Frontier was a soldier - in contrast to every 62nd inhabitant in the rest of the Habsburg Monarchy. The Frontier soldiers became a professional military, ready to move to all European battlefields. Due to further immigration of refugees from the Ottoman domain, and to the expansion of the territory to places previously controlled by the Ottomans, the population of the Frontier became even more mixed. There were still many autochthonous Serbs and Croats in Slavonia and in parts of present-day Vojvodina (in Syrmia, Bačka and Banat). However, at this time they became outnumbered by the Serb, Croat and Vlach refugees/immigrants. Some Germans, Poles, Magyars and Slovaks also came to the Frontier, mostly as administrative personnel, and a number of other settlers and military personnel arrived from other parts of the Habsburg Empire - Czechs, Poles, Slovaks, Ukrainians, Rusyns and others. In 1783 the Croatian and Slavonian frontiers came under the unified control of the Croatian General Command headquartered in Zagreb. The Serbian Free Corps of 5,000 soldiers had been established in Banat, composed of refugees who had fled earlier conflicts in the Ottoman Empire. The Corps would fight for the liberation of Serbia and for unification under Habsburg rule. Several freikorps operated along the Habsburg-Ottoman frontier. The Austrians used the Corps in two failed attempts to seize Belgrade, in late 1787 and in early 1788. Serbia was subsequently liberated, and organized into a Habsburg protectorate. On 8 October 1789 Ernst Gideon von Laudon took over Belgrade. Austrian forces occupied Serbia, and many Serbs fought in the Habsburg free corps, gaining organizational and military skills. By 1791, however, the Austrians were forced into withdrawal across the Danube and Sava rivers, joined by thousands of Serb families who feared Ottoman persecution. The Treaty of Sistova (1791) ended the Austro-Turkish War of 1787. In 1787 the civil administration became separate from the military, but this was reversed in 1800. In 1848, Josip Jelačić, Ban of Croatia, became the commander of the Military Frontier. He pressed for the unification of Croatia, Slavonia, Dalmatia, and the Croatian-Slavonian Frontier. Although he did not have the power to abolish it, he secured approval for reforms and in 1848 the Military Frontier sent representatives to the Croatian Sabor, however, this was revoked in the 1850s. From 1850 the Frontier, Croatia and Slavonia constituted a single land with separate administration and representation. The Main Command had its headquarters in Zagreb, but remained directly subordinate to the Ministry of War in Vienna. The Croatian Parliament made numerous pleas to demilitarize the Frontier after the Turkish wars subsided. The demilitarization began in 1869 and on 8 August 1873, under Franz Joseph, the Banat Frontier was abolished and incorporated into the Kingdom of Hungary, while part of the Croatian Frontier (Križevci and Đurđevac regiments) was already incorporated into Croatia-Slavonia on 1 August 1871. The decree in which the rest of the Croatian and Slavonian frontiers were incorporated into Croatia-Slavonia was proclaimed on 15 July 1881, while incorporation began on 1 August 1881, when Ban of Croatia Ladislav Pejačević took over from the Zagreb General Command. Danube Military Frontier 1702–1751 Comprised parts of southern Bačka (including Palanka, Petrovac, Petrovaradinski Šanac, Titel, etc.) and northern Syrmia (including Petrovaradin, Šid, etc.). After the abolishment of this section of the Frontier, one part of its territory was placed under civil administration and another part was joined with other sections of the Frontier. Tisa Military Frontier 1702–1751 Comprised parts of north-eastern Bačka (including Sombor, Subotica, Kanjiža, Senta, Bečej, etc.). After the abolishment of this section of the Frontier, most of its territory was placed under civil administration, while one small area in the south remained under military administration as part of the Šajkaš Battalion. Mureș Military Frontier 1702–1751 This frontier included the region of Pomorišje, the area on the northern bank of the river Mureș. After the abolishment of this section, its entire territory was placed under civil administration. Sava Military Frontier 1702–1751 It was located along the Sava river. Banat Military Frontier 1751–1873 It was located on the present-day Serbian-Romanian border. It was divided into Serbian (Illyrian), German (Volksdeutscher) and Romanian (Vlach) sections. Slavonian Military Frontier 1745–1881 It was located along Posavina, from eastern Croatia, following the river Sava, along the border with Bosnia-Herzegovina and Serbia, and stretched into Syrmia, until inflow into Danube near Zemun (today part of Belgrade). Its north-eastern border followed the Danube up until the Petrovaradin. Croatian Military Frontier 1553–1881 It was located on the border of Croatia and Bosnia. This part of the Military Frontier included the geographic regions of Lika, Kordun, Banovina (named after "Banska krajina"), and bordered the Adriatic Sea to the west, Venetian Republic to the south, Habsburg Croatia to the west, and the Ottoman Empire to the east. It extended onto the Slavonian Military Frontier near the confluence of the rivers Una and Sava. Šajkaš Battalion 1763–1873 It was a small part of the Frontier that was formed in 1763 from parts of the previously abolished Danube and Tisa sections of the frontier. In 1852, Šajkaš battalion was transformed into Titel infantry battalion. It was abolished in 1873, and its territory was incorporated into Bačka-Bodrog County. Transylvanian Military Frontier 1762–1851 It was located in the eastern and southern parts of Transylvania. It was composed of two Székely and two Romanian regiments. The establishment of the frontier was followed by the Mádéfalva Massacre or Siculicidium. Many Serbs emigrated to the north toward the southern regions of Hungary during the period when the territory of Serbia was largely under Ottoman rule. In order to attract Serbs into Hungary, emperor Leopold I decreed that they would be allowed to elect their own ruler, or Vojvoda, from which the name Vojvodina derives. In 1690, about 30,000 to 70,000 Serbs settled eastern Slavonia, Bačka and Banat in what became known as the Great Serbian Migrations. Later the Habsburgs did not allow Serbs to elect their own vojvoda; they incorporated the region into the military frontiers of eastern Slavonia and the Banat. However, the strong Serb presence in the region resulted in Vojvodina serving as the cradle of the Serbian renaissance during the 19th century. Wikimedia Commons has media related to Habsburg Military Frontier. ^ Aleksa Djilas (1991). The Contested Country: Yugoslav Unity and Communist Revolution, 1919-1953. Harvard University Press. pp. 11–. ISBN 978-0-674-16698-1. ^ a b c Jelavich 1983, p. 145. ^ Plamen Mitev (2010). Empires and Peninsulas: Southeastern Europe Between Karlowitz and the Peace of Adrianople, 1699-1829. LIT Verlag Münster. pp. 171–. ISBN 978-3-643-10611-7. ^ a b c Paul W. Schroeder (1996). The Transformation of European Politics, 1763-1848. Oxford University Press. pp. 58–59. ISBN 978-0-19-820654-5. ^ Glasnik Srpskoga učenog društva. 20. 1866. pp. 69–. ^ R. S. Alexander (30 January 2012). Europe's Uncertain Path 1814-1914: State Formation and Civil Society. John Wiley & Sons. pp. 19–. ISBN 978-1-4051-0052-6. ^ Horvat 1906, pp. 157. ^ Horvat 1906, pp. 289-290. ^ Bundesministerium für Inneres 1859, p. 179. ^ Bundesministerium für Inneres 1859, p. 172. ^ Bundesministerium für Inneres 1859, p. 176. Jelavich, Barbara (1983). History of the Balkans. Cambridge University Press. pp. 145–151. ISBN 978-0-521-27458-6. Dragutin Pavličević (1984). Vojna krajina: povijesni pregled, historiografija, rasprave. Sveučilišna naklada Liber. John Van Antwerp Fine, When ethnicity did not matter in the Balkans: a study of identity in pre-nationalist Croatia, Dalmatia, and Slavonia in the medieval and early-modern periods, University of Michigan Press, 2006 ISBN 0-472-11414-X. Potiska i pomoriška vojna granica (1702–1751), Muzej Vojvodine, Novi Sad, 2003.